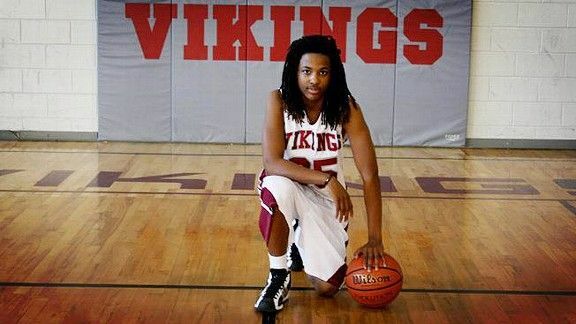 Multisport athlete Kendrick Johnson was found dead in his Georgia high school’s gym in January. Authorities ruled it an accident, but Johnson’s family believes something very different — and a second autopsy appears to support their suspicions. Kendrick Lamar Johnson was 17 and muscled and often quiet. He was 5-foot-10 and 160 pounds — an undersize power forward, a seamless hurdler, and a safety who hit like a linebacker. His favorite hamburger came from a truck stop down I-75, just on the other side of Wildwood. He rarely started fights, but when provoked he ended them. His favorite college football team depended on when he was asked: Some days it was Florida, other days Ohio State, and every now and then he’d say he favored UNLV. He hoped to someday learn to grill as well as his father, to win state, and to go to college. He would do none of those things. We know that on the morning of Thursday, January 10, he arrived at Lowndes High School wearing three layers of shirts — a white tank top, an orange T-shirt, and a white T-shirt — as well as a belt, jeans, black gym shorts, and boxers. Somewhere on him, he had a Starburst wrapper. We know this from the initial autopsy report, though that document’s assertions have now been called into question. We know he attended classes that day. We know he talked with friends. And we know that at 1:09 p.m., he walked into the school gymnasium. Exactly what happened next — that’s unclear. Memories of the next day come in flashes. There’s Jackie in the school at 8:30 a.m., asking if anyone had seen her son. There were the text messages she received while sitting in the guidance counselor’s office: There are ambulances and fire trucks in the parking lot. No one can come in the entrance. Then there was the sentence she wasn’t supposed to hear, the one said to the guidance counselor, whose phone’s volume was turned up too loud. “They found a body in the gym,” the voice on the other end said, according to Jackie. The counselor left the room, and that’s when Jackie knew. 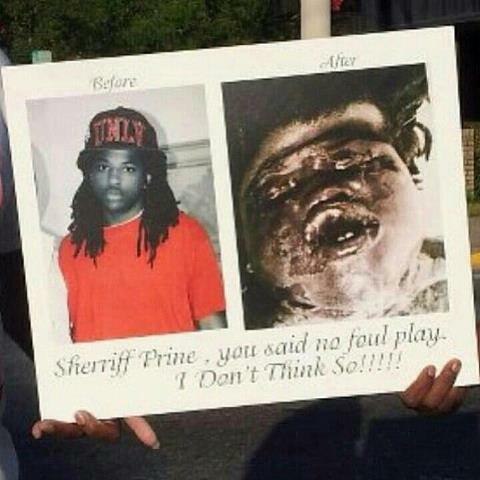 The Lowndes County sheriff’s department has declined to discuss the case with Grantland. On behalf of all school officials, assistant superintendent Troy Davis has offered “no comment.” This account of what happened on the morning of January 11 comes from the sheriff department’s incident report, which was acquired through an open records request. Lowndes High head athletic trainer Philip Pieplow handed out surveys to the students in his Life Sports class that morning. After completing the survey, a girl climbed on top of a set of blue cheerleading mats, which were rolled up and standing vertically in a corner of the gym. Inside one of the mats, she saw two feet. Panicked, she called friends to come and see. They looked at the white socks with gray toes, “Hanes” written across them in red lettering. Someone screamed. Pieplow sprinted across the room. When he pushed the mats onto their sides, a black male’s body from the waist up tumbled out of one of them, along with blood and dreadlocks and vomit. Pieplow backed away. Another coach told the students to leave the gym. Someone — several people — called 911. At 10:35 a.m., officers from the sheriff’s department arrived. Soon, more followed. They canvassed the scene and began taking photos. They interviewed students who had been in the gym when the body was discovered. Late in the afternoon, officers called Lowndes County coroner Bill Watson. By the time he arrived, rigor and livor mortis had already begun to set in. At 4:35 p.m., six hours after the first officers arrived, Watson made his declaration: Kendrick Johnson was dead. But that evening, the sheriff’s department issued a statement: A body had been found at Lowndes High School. Foul play was not suspected. As the investigation progressed, detectives pieced together a theory for what they believe happened on January 10. The surveillance footage has not been released. The sheriff’s attorney, James Elliott, says the department is withholding the video because it reveals the identity of other minors who were in the gym near that time. Also for this reason, the names of all students are redacted in the incident report. But what caused him to tumble headfirst into a rolled-up cheerleading mat? For investigators, the answer centered on a pair of black-and-white Adidas Pro Models. When officers arrived at the scene, they found a shoe near Kendrick’s body. In the sheriff’s version of events, that sneaker was key to Kendrick’s death. One student told Detective John Marion that in the previous semester he had seen Kendrick place his gym shoes in the rolled-up mats and retrieve them the next day, according to the incident report. Students were known to store shoes in the mats because they were more convenient than lockers and didn’t require rental fees. Stuck in the mat, blood rushed to Kendrick’s head, the sheriff believed. Georgia Bureau of Investigation medical examiner Maryanne Gaffney-Kraft, who later performed the autopsy, declined comment for this story, but I asked former North Carolina chief medical examiner John Butts to review the case and explain what may have happened next. “In that position,” he said, “a few things could be going on. The abdominal organs could be pressing against the diaphragm, making it more difficult for the diaphragm to flatten. There could also be the matter of the tightness of the mat compressing the chest, which would do the same thing. And if his face were pressed up against the inside of the mat, then that could impede him from drawing in air. It could be a combination of those things.” Over time, investigators believe, Kendrick’s breathing slowed. Eventually, it stopped. Kenneth and Jackie Johnson never really believed that version of events. It was true that Kendrick didn’t have a locker. “He always said he didn’t want one,” Kenneth remembers. So perhaps he did store his shoes in the mats. But as for the other pieces of the theory — to the Johnsons, they just didn’t fit. For one, they would say, why would he try to reach all the way down into a mat to grab his shoes? The mat was about 6 feet tall; there was no way he could expect his arms to reach the bottom. And even if he did reach into the mat, how could he have fallen in? The center hole in the top of the rolled mat was 14¼ inches in diameter, according to the incident report, but the coroner measured Johnson’s shoulders as 19 inches across. He couldn’t even fit into the mouth of the hole, they believe, much less fall all the way to the bottom. And what about all the other people who used the gym that day? Could no one see him? If Kendrick fell in arms first and hit the bottom of the mat, the Johnsons ask, wouldn’t his legs have been sticking in the air? The Daily Times reported that the mats were 7 feet tall. At that height, they would have been tall enough to fully conceal Kendrick’s body. But the incident report says the mats were only 6 feet 2 inches, and after Kendrick’s death the Johnsons took photos of Kenneth standing next to the upright mats, all of which make them appear to be about 6 feet in height. Kendrick was 5-foot-10. The Johnsons argue that if he’d fallen in with his arms stretched out in front of him, then at least part of his legs would have remained sticking out. Then, the Johnsons ask, why didn’t anyone hear his voice? Could he not scream? The video shows Kendrick entering the gym at 1:09, according to the incident report. The school bell rang for the next class to begin just 14 minutes later. It’s unclear how long it would have taken Kendrick to lose consciousness, but, says Butts, “it wouldn’t have been immediate.” Students used the gym later that afternoon to play basketball. The color guard held a practice there that night. If Kendrick were trapped, the Johnsons ask, wouldn’t he have called for help? The mats were near a wall, but still easily within view and earshot of center court. For his grieving parents, it’s hard to believe that none of the other people using the gym that day would have heard him. One of the photographs included in the investigative report raises another question about Kendrick’s death. It shows Kendrick’s other pair of shoes, orange-and-white Nikes, in the mat with Kendrick, only they’re not at the bottom of the mat where Kendrick would have been reaching. Instead, the Nikes are almost on top of him, lodged between Kendrick’s lower body and the inside of the mat. If Kendrick was reaching into the mat when he fell, then how, the Johnsons ask, did a pair of shoes end up falling in after him? And then, the Johnsons ask, what about the video? The sheriff’s department has not made it available to the public — or to the Johnsons — citing the fact that it shows the identity of other minors who walked in the gym about the same time as Kendrick. In statements to the local media, Lieutenant Stryde Jones has explained that it shows Kendrick walking in at 1:09 and shows other students walking in several minutes later. But isn’t it possible that the video could provide answers to the Johnsons’ questions and confirm the sheriff’s department’s account of Kendrick’s death? The sheriff’s department did not respond to Grantland’s request for an explanation of what, exactly, the video shows. Ashley Paulk, who served as Lowndes County sheriff for 16 years, was twice named Georgia’s Sheriff of the Year, the first person to earn that distinction. But even if you don’t believe the worst, it’s hard to disagree with the Johnsons that some aspects of the sheriff’s account make little sense. The Johnsons are demanding a convincing explanation of how their son died, and so far, they believe, Valdosta’s authorities have failed to provide one. Today, when Kenneth and Jackie Johnson call for action — when they organize rallies and go on television to demand answers and stand outside the Lowndes County courthouse wearing protest T-shirts — they begin their story with that Friday night. First, there was the issue with the coroner. According to Georgia law, police must notify the local coroner or medical examiner immediately after discovering a dead body. In this case, they waited. The morning Kendrick was found in the school gym, Lowndes County coroner Bill Watson sat about a mile away in his office, hearing rumors of a dead body at the school and wondering what was going on. When I interviewed Watson, he hesitated before speaking about the case. “This thing has gotten out of hand,” he said. Weeks before, he asked CNN’s Victor Blackwell to destroy an interview they conducted, according to Blackwell’s Twitter account. When it came time to identify the body, Kenneth was still on his way back from Pennsylvania. Eddie Tooley, Kendrick’s grandfather, requested to see the body, and according to Tooley, he was refused. (Again, Sheriff Prine declined to be interviewed for this story. Chief Deputy Joseph Crow did not respond to an e-mail requesting comment on the department’s interactions with Kendrick’s family.) Georgia law says that if the next of kin — or an agent of the next of kin — requests custody of a dead body, authorities must release it within 24 hours of the request. Unless, that is, an officer, a coroner, or a medical examiner has made a written finding that suspects foul play. And by Friday night, the sheriff had already announced that he did not. On Sunday, he did. Kenneth drove to the Valdosta-Lowndes Regional Crime Laboratory. He met two deputies and a crime scene technician, who escorted him to the room where the body was held. The temperature inside the room was surprisingly warm, Kenneth remembers. “I thought to myself, When they open the drawer, it will be cold.” Only, according to Kenneth, it wasn’t. Instead, he says, hot air rushed upward from around his son’s body. When he saw Kendrick’s body, he wasn’t thinking of saying good-bye or finding closure. He was examining his son’s remains for any indication of the misconduct he suspected. Kenneth bent over, leaned in close. He stuck his nose inches from Kendrick’s skin, moved his eyes up and down the corpse. The lips were swollen, the skin blackened. Kendrick’s face looked so unlike that of the boy who used to giggle while riding to Alabama or Florida in Kenneth’s 18-wheeler. Kenneth wanted to memorize the body he saw now — the body that didn’t look like his son’s. He noted some scratches on Kendrick’s hands and discoloration in his face. He even checked the fingernails. They looked like they’d been clipped. This was strange, Kenneth thought. Kendrick always kept his nails long. Aside from failing to immediately notify the coroner on the day Kendrick’s body was discovered, there was another problem in handling his remains. The Monday after his death, the corpse was sent about 150 miles north to the Georgia Bureau of Investigation crime lab near Macon for an autopsy. After it was completed, the body was returned to Valdosta. The corpse had been moved by Steve Owens, a retired Valdosta police officer who owns a company that transports the deceased. When Owens retrieved the body from the crime lab, he signed a property inventory sheet acknowledging receipt of two white socks, a pair of pants with a belt, black shorts, boxers, and three T-shirts. Typically, a body is returned to the family with a bag of personal effects — clothing, accessories, and anything else found with the deceased at the time of death. That day, Harrington Funeral Home received two bodies from the GBI crime lab. One arrived with clothing. The other body — Kendrick’s — did not. Instead, it came only with a pair of broken headphones. Somewhere between Macon and Valdosta, Kendrick’s clothes had disappeared. The Johnsons believe these items may have contained evidence indicating a physical struggle, giving weight to their suspicion that Kendrick’s death was no accident. More importantly, they could have fiber or DNA evidence. Owens, who transported the body, did not respond to requests for comment. As for what the clothing may have shown, the Johnsons may never know. Eventually, the GBI’s autopsy results corroborated the sheriff’s theory. Cause of death: positional asphyxia. Manner of death: accidental. The medical examiner saw no “obvious foreign body material or acute damage,” she wrote, and noted only superficial abrasions and tears on the fingers and the right wrist. In terms of evidence, King, the Johnsons’ lawyer, doesn’t focus on the grotesque image, which is now infamous around Valdosta. A post-autopsy photo reveals little about the way a body looked upon death, he says. Instead, King emphasizes the photos taken immediately after Kendrick’s body was discovered — photos that show discoloring on Kendrick’s face — as well as notes about the body’s condition in the EMT report. King believes there were signs of bruising the medical examiner missed. That’s why the Johnsons showed up at sunrise that day at the cemetery, why they paid to have Kendrick’s body exhumed using funds from their attorney’s office and some donations. After they lifted Kendrick’s casket from the ground, his body was sent to Florida pathologist Dr. William Anderson for a second autopsy. Let’s go back to June — five months after Kendrick’s death. Kenneth and Jackie are on the corner of Valley and Ashley streets, just footsteps away from the Lowndes County courthouse. For 10 weeks they’ve been here, Monday through Saturday, 8:30 a.m. to 5 p.m., making sure that anyone who drives through downtown Valdosta dare not forget what happened to their son. Jackie has the summer off from her job as a school bus driver, and Kenneth hasn’t taken any truck-driving routes since Kendrick died. For now, the Johnsons say, they get by on support from family and friends. And by continuing to make their voices heard, they believe they can bring enough attention to their son’s case to push for a full review by the U.S. Department of Justice’s Civil Rights Division. In the meantime, Kenneth sits on a foldout chair by the south corner. Overhead, the June sun has conspired with the humidity to push the heat index to 108 degrees, so he tries to stay near the trees. He wears a white T-shirt with red lettering: “I AM KENDRICK JOHNSON.” He and Jackie have had about 700 shirts made; most have been given away, but the Johnsons have kept about 30 for themselves. They bear slogans like “Remember Me” and “Justice for KJ,” and rare is the day when Kenneth and Jackie leave home wearing anything else. Go back almost a century. 1918. One of the first times in documented history that a black person demanded justice in Lowndes County. It started with a man named Hayes Turner, who was arrested for his alleged involvement in the death of a white plantation owner. While Turner was being transferred from one jail to another, he was stopped by a mob and killed. His wife, 20 years old and eight months pregnant, took issue with her husband’s murder and threatened to press charges against his killers. Her name was Mary Turner. 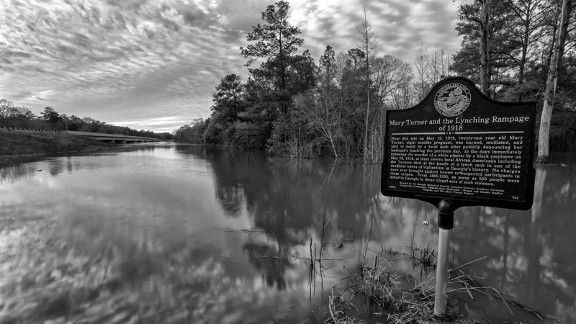 If you drive up Highway 122 and continue a mile past Little River Groceries until you hit Folsom Bridge, you can find the spot where she was lynched. There’s a sign here, erected in 2009 to make sure no one forgets. Look out over the water — it’s called Little River but it looks more like a swamp — and you’ll see gnats and dragonflies and the place where her killers hung her upside down, cut out her unborn child, filled her body with bullets, and set her on fire. Back then, the mob marked her grave with a bottle of whiskey and a cigar. Today, you can just look for the discarded case of Bud Light Platinum and the empty packs of Marlboro reds left behind by passersby. “At least I hope that’s a joke,” says Floyd Rose, pastor at Serenity Church. “The way things are around here, I’m not so sure.” Joke or not, this much is true: Other than a few sit-ins and a little unrest during desegregation, the civil rights movement never gained much traction in Lowndes County. Among the agents of local change: football. Both of the public high schools, Valdosta and Lowndes, have long drawn diverse crowds to watch white and black kids on the field together, dominating the rest of the state. Valdosta High has more all-time wins than any other school in the country. The Wildcats could go winless for at least the next two seasons and they would still hold that distinction. But in recent years Lowndes, the school Kendrick attended, has emerged as a powerhouse, winning state titles in 1999, 2004, 2005, and 2007. Kendrick dreamed of following Lowndes alumni Randall Godfrey and Jay Ratliff to the NFL. A physical but undersize safety, he was more likely to end up playing at an FCS college, his middle school coach James Mitchell says. Yet his career had stalled. In the spring, he’d walked off the practice field after an argument with a coach. When he tried to return to practice, he was refused. Kendrick was told he’d have to miss his sophomore season, then return to the Vikings as a junior. When he did, Kendrick would join a team that, along with Valdosta High, plays in Georgia’s largest division, taking regular rides up to Atlanta to beat the rest of the state’s top squads. He goes even further. “Compare this community to the other communities in this part of the state,” King says. “We’re sitting just off I-75, one of the arteries of this country. You have a large shopping mall here, an amusement park4 that makes people stay in Valdosta rather than going to Orlando. You have this university5 that tremendously impacts the way of life and the culture, that even has people thinking, What a progressive community we are. If you’re a businessperson in this region, Valdosta is where you want to be. And at the heart of that — just like at the heart of any community — are the schools. And at the heart of the schools, there’s football. Just ask Mia Edgerton. She’s 15 years old, part of the generation supposedly unable to see color. She was 13 on the night her father walked out the door of the radio station where he worked and took two bullets to the body and another to the head. Stephon Edgerton lived just long enough to call 911 on that night, long enough to tell them what he saw: a white male firing at him in the parking lot. As much as life in Valdosta has changed since Mary Turner was killed — and as far as race relations have progressed between then and now — there remain families like the Edgertons and the Johnsons, whose grievances are real. The most racially divisive moment in Valdosta’s recent history occurred in 1998, and its similarities to Kendrick Johnson’s case are striking. On September 1 of that year, Willie James Williams Sr. was pulled over for driving on the wrong side of the road, then removed from his car after a sheriff’s deputy discovered an outstanding warrant in his name. He was arrested and taken to jail. The next morning, Williams was found unconscious in his cell and pronounced dead at a hospital. Williams’s death gave rise to a movement. Some 2,000 locals — most black, but some white — organized to demonstrate in Williams’s name. Never before had the city been organized quite like this, with a crowd marching through downtown, singing a chorus of amens that could be heard in the jail, while the cell blocks filled with cheers. The autopsy report said that Williams died of a hematoma resulting from blunt-force trauma to the head, and the case went to a coroner’s inquest. The officer admitted to pushing Williams, but he claimed that he did so only to control him as Williams resisted arrest. After reviewing the evidence and testimony, the three white jurors declared the death accidental, according to a documentary about the case called A Chorus of Fear. The two black members on the panel disagreed. The U.S. Department of Justice took up the case, but in 2001 its investigation concluded that there was insufficient evidence to contradict the officer’s claim that he only pushed Williams to restrain him. Eventually, the rallies stopped. Nothing more could be done, so the moment passed, but the memory of Williams’s death and the racial tension it stirred remained in Valdostans’ minds. For the black community, the case opened a wound that never fully healed. Willie James Williams Jr. still lives in Valdosta, in an extended-stay motel on the east side of town. The night I meet him there, Williams is wearing a white T-shirt, blue jean shorts, and white socks underneath his shower sandals. “He was never around much when I was little,” Williams says of his father. “Just off doing whatever it was he was doing. But we were just starting to get to know each other, get close. We’d go up to the lake — catch some bream, some catfish. He would help us work on our cars. Once in a while, Williams will get picked up for violating his probation for enticing a minor. He’ll spend a night in the old jail, the one just off Madison Highway, and he’ll watch roaches in the shower and gnats hovering around his cell. “You can smell death in that jail,” he says, and on those nights, he tries to keep his mind from dwelling on what it was like all those years ago, on the night his dad entered that very same building. The last night of his life. I ask: But what about you? You held rallies and marches for your father. The whole community was organized. A pause. Later, he lifts his arm to show me the red band on his wrist. In black letters, it reads “JUSTICE FOR KJ.” “I wear it every day,” Williams says. “Every single day. The parallels between Willie Williams Sr. and Kendrick Johnson are clear. Both were black. Both died suddenly. The bodies of both were found on government property — Williams at the jail, Johnson at the school — and both deaths left their communities shocked and confused. Both families raised questions about the circumstances surrounding their loved ones’ deaths, and both families took to public forums to call for justice. Williams’s family hired a Johnnie Cochran–affiliated lawyer. 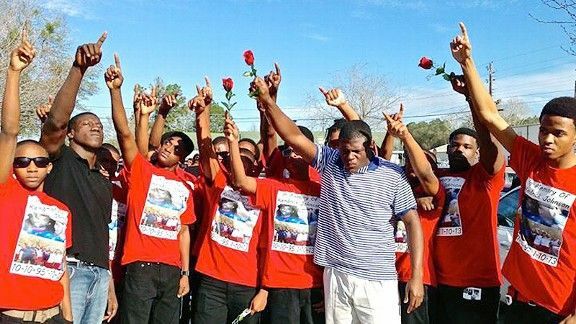 Johnson’s family held a rally with Al Sharpton. It’s too simplistic, however, to paint Kendrick’s case as an issue that has divided black from white. Yes, most of the protesters have been black and so were most of the people who appeared in a music video about Kendrick’s case, but that’s partly because most of the Johnsons’ friends are black and partly because nearby black institutions are accustomed to organizing demonstrations. But you’ll also find dissent within the black community. When I spoke to him in June, the Rev. Floyd Rose, the pastor and civil rights leader, acknowledged the troubling inconsistencies in the investigation but remained skeptical that Kendrick was killed. Yet Kendrick’s race, Valdosta’s history, and the nationwide dynamic of distrust between many black communities and local authorities — all of that lurks just below the conversation’s surface. Kenneth and Jackie know that. They see their fight as being about Kendrick first, but also about themselves and their community, about a willingness to demand what they believe so many others have been denied. But it is also easy, when you look at the facts surrounding KJ’s case, to believe it was not an accident. All you have to do is spend a few hours examining the evidence alongside the Johnsons, and if you approach that evidence with the assumption that our institutions do not always serve the public interest — that sometimes they choose to protect themselves instead of their communities, that sometimes they find one kind of justice for one kind of person and another kind of justice for others, that sometimes they use the powers of the state to conceal the truth — if you believe that, then the pieces fit together to form an altogether different picture. A boy walked into a gym — again, that we know. But maybe he didn’t reach. Maybe he didn’t fall. Maybe something else happened, and that something else explains why he ended up in a mat narrower than his shoulders; why none of the students who entered the gym after him saw his feet or heard his cries; why his clothes went missing; why the EMT reported bruising; why the coroner was not immediately called to the scene; why the second autopsy declared that Kendrick died by blunt-force trauma, that there was no asphyxia, that there was no accident. But whether you trust the sheriff, you trust the Johnsons, or you trust neither — each day remains the same for Kendrick’s parents. They gather their signs and load them into their truck, and they ride out to the corner of Valley and Ashley. By the time they arrive the sun is already blazing overhead. Within minutes sweat stains will turn their T-shirts dark, but now together they walk to that same spot — a few footsteps from the courthouse, a few miles from the jail where Willie Williams Sr. turned up dead, a few blocks from the radio station where Stephon Edgerton was shot, a few highway exits from the bridge where Mary Turner once hung, and a few left turns from the gym where students found Kendrick in a pool of his own blood. There, the Johnsons fold out their chairs. They put umbrellas overhead. They fan themselves to cool. They sit. It’s going to be a long day.